MK Dons' hopes of Championship survival appear increasingly remote despite ending a four-game losing run in a dramatic draw with Preston at Deepdale. Jermaine Beckford lifted the ball over Cody Cropper to put Preston ahead before Eoin Doyle's header was cleared off the line by MK Dons' Darren Potter. After Nicky Maynard levelled, keeper Cropper was sent off for fouling Doyle. Striker and makeshift keeper Alex Revell saved Joe Garner's penalty and both sides went close to a late winner. A point leaves MK Dons nine points adrift of safety with four games remaining. 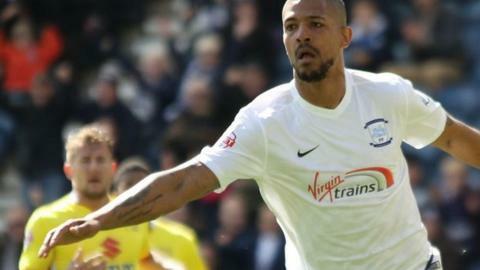 Beckford, making his first start since returning from knee surgery, netted his first goal since scoring a hat-trick in last May's League One play-off at Wembley to help Preston win promotion. The hosts looked increasingly menacing as the first half continued, Greg Cunningham testing Cropper and Doyle going close after Maynard called Preston keeper Andres Lindegaard into action at his near post. Karl Robinson's Dons came out brightly after the interval and levelled when Maynard turned in Josh Murphy's cross at the far post. Doyle and Maynard had chances in quick succession, while a fine save from Lindegaard denied Kyle McFadzean. Cropper's challenge on Doyle, however, gave Preston their best chance to win the game, only for Revell to take the gloves and keep Garner out. Despite needing treatment after the save, Revell remained solid under pressure late on. "It's probably the angriest I've been after a game for a long time. I'm not accepting that second half performance from certain individuals. I do not want this season to peter out. "The penalty miss probably summed up the second half performance. I had a feeling that Joe was going to go and miss it. Some of our players have to look at themselves in the mirror. They've had a lot of praise this season and rightly so. "There's few occasions where I've had to have a go at the players. But they have to look at themselves to see what they can do just to be in the team. They are still playing for places next year." "I think we have to appeal the red card because what do you lose? We still believe that we can turn this around and it would be phenomenal. I'm a believer. "Whilst you have belief you still have hope, but you don't have any hope without belief and we need to keep believing in some way. And if we don't achieve it then we put some pride back in the shirt. "These kids are honest kids and they deserve some luck. I don't know where I get it from but I believe in them as people. We just got to keep going. We go again, off to Hillsborough and our backs are certainly against the wall." Match ends, Preston North End 1, MK Dons 1. Second Half ends, Preston North End 1, MK Dons 1. Attempt missed. Callum Robinson (Preston North End) header from the centre of the box is too high. Assisted by Greg Cunningham with a cross. Attempt missed. Josh Murphy (MK Dons) left footed shot from the left side of the box is close, but misses to the right. Assisted by Darren Potter. Delay in match Alex Revell (MK Dons) because of an injury. Attempt missed. Joe Garner (Preston North End) right footed shot from the centre of the box is too high. Assisted by Paul Gallagher. Attempt saved. Joe Garner (Preston North End) with an attempt from long range on the left is saved in the bottom left corner. Assisted by Alan Browne. Corner, Preston North End. Conceded by Alex Revell. Penalty saved! Joe Garner (Preston North End) fails to capitalise on this great opportunity, right footed shot saved in the top right corner. Cody Cropper (MK Dons) is shown the red card. Penalty conceded by Cody Cropper (MK Dons) after a foul in the penalty area. Penalty Preston North End. Eoin Doyle draws a foul in the penalty area. Corner, Preston North End. Conceded by Dean Lewington. Substitution, Preston North End. Callum Robinson replaces Adam Reach. Offside, Preston North End. Anders Lindegaard tries a through ball, but Joe Garner is caught offside. Attempt missed. Alex Revell (MK Dons) right footed shot from outside the box misses to the left. Assisted by Samir Carruthers. Attempt missed. Daniel Johnson (Preston North End) left footed shot from outside the box is too high. Attempt saved. Kyle McFadzean (MK Dons) right footed shot from very close range is saved in the centre of the goal. Assisted by Dean Bowditch with a cross. Jonathan Williams (MK Dons) wins a free kick on the left wing. Attempt missed. Daniel Johnson (Preston North End) left footed shot from outside the box is high and wide to the right. Assisted by Paul Gallagher. Substitution, MK Dons. Alex Revell replaces Nicky Maynard. Substitution, Preston North End. Joe Garner replaces Jermaine Beckford.